At my last ABC (Association of Bridal Consultants) networking meeting, we learned about the different styles of dresses and coordinating the dresses with our brides body shape. This meeting was held at the new location for Almond Tree Wedding Boutique. Almond Tree was started by the two Pam’s (that is how I refer to them); Pam Hardy and Pam Keough. They wanted to create a place where bride’s could get quality dresses and not spend the bulk of their wedding budget on the dress. Almond Tree has dresses on consignment and close outs from wedding stores. 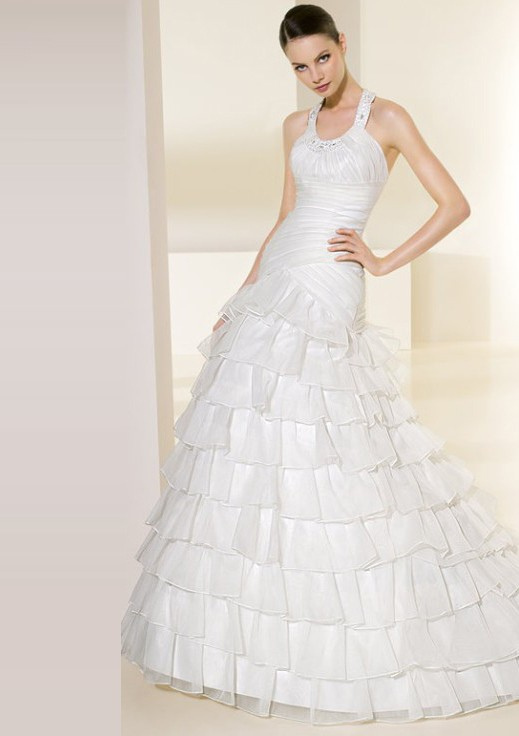 They carry dresses and accessories at deep discount in comparison to the big name bridal stores. Alyssa Eisele, of Bellisima Weddings and is also employed at Almond Tree, educated us on the types of body styles. There is the pear, rectangle, apple, hour glass shape. The brief description of the body types follows and the types of dresses that would flatter them the most. Pear -Small on the top and larger in the hips; would look best in a dress with a belted waistline and flowing skirt. Rectangle -Straight up and down, no definition at waist, should look for a dress that gives curves and has a belted waist. Apple -Larger on the top half and tappers to pretty small on the bottom half, a dress that emphasizes the bust (v-neckline) and waist with a slight flare to the skirt. Hour Glass – Very shapely in the bust and hip area, small waist, any dress with a scooped neckline, natural waistline emphasized and flowing skirt.